Beta is here! So, with this update the game is more or less feature complete (there probably will be some additional features along the way). Now I’m focusing on balancing and polish. If you find any spelling mistakes, cosmetic interface things and so on, please post on the steam group. Also translation to several languages in planned. This version introduced a lot of smaller improvements. Also the experimental feature translation to other languages seem to be working quite well, so probably it will be moved to regular options in the next version or so. – [feature] New cars start being distributed in all regions with sales offices (instead of just in home region) by default. – [feature] Finished experimental feature translation to Polish (more languages will be coming soon! ), to enable it go to Options and enable experimental features. – [misc] Driveability renamed to Handling. – [balance] Harder on high difficulty levels and easier on low difficulty levels (AI car prices adjusted). – [interface] Finished all tooltips (car & component designer). – [interface] Made it more clear that model is not sold in ANY region (red notice). – [interface] Smaller font for regions without any sales offices on car details screen (distribution). – [interface] Added sold cars per model in a tooltip and car icons to Quarterly report. – [interface] Added moving cars animation to the main menu screen (animation speed of those cars depends on difficulty level selected :)). – [interface] Adjusted main menu colors, position of elements, etc. Also added a link to Stellar Monarch and the official website. – [fix] Fixed idle belt cosmetic bug (when you were stopping making a car in your factory and idle a belt, the level of production was displayed incorrectly, also workers were retained). – [fix] Various small fixes. 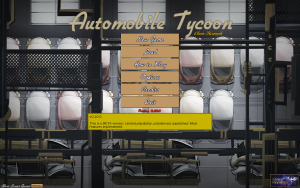 This entry was posted in Automobile Tycoon, New Version on December 7, 2017 by Chris.